I’m lucky that, at present, I have more time for cooking (and thinking about food) than I would do normally. This means that most of our evening meals have become more interesting and more diverse. It also means … more time to think about cake. I have my favourite chocolate brownie recipe (thank you, Nigel Slater) but I’m not so loyal to it that I won’t try something else. I spotted this recipe for chocolate caramel brownies on taste.com.au in the run up to Valentine’s Day and decided it looked worth a go. The first block of caramello chocolate was eaten so we had to have a second attempt (I bought the chocolate and made the brownies within 24 hours to prevent the same thing happening again). As you might expect, I also deviated from the recipe. Begin by putting a 220gm block of caramel chocolate in the freezer (this is to make it easier to break/chop up). Grease and line (fully, not just base line) with baking paper a tin – I always use my smallish roasting dish for brownies and preheat oven to 160°C (fan, 180°C otherwise). Melt 180gm of dark chocolate (broken up) with 150gm of unsalted butter (chopped). I used to be too scared to melt chocolate in the microwave but I braved it once and have never looked back. It’s a LOT quicker than standing over a double boiler, and because it takes less time I find I’m less likely to get distracted, start doing something else and end up with the chocolate seizing. Yes, you do need to keep an eye on it (I open the microwave and give the chocolate a stir every 30 seconds – 1 minute or so) but you’d be doing that in a double boiler anyway. So, give microwaving your chocolate a go! I then tipped the chocolate and butter mix in to the KitchenAid and, using the flat beater, mixed in ½ cup of caster sugar. When that was well combined I left the mixture to cool a little (actually, at that point I went and helped bath the baby … you don’t need to leave it that long though!) before beating in 2 eggs. Now, at this point the recipe adds in 1 ¼ cups of plain flour. That just didn’t seem right to me – plain flour and no raising agents? So I used self raising flour. Beat this in, along with 2 tbsp of cocoa. When everything is combined (and I found the mixture to be very thick – almost dough like in the way it clumped together and came away from the edges of the mixing bowl) mix in the caramel chocolate, broken in to squares. It was because of the caramel chocolate that I used the KitchenAid rather than the trusty MagiMix. Tip the mixture in to the prepared tin, smooth out as much as possible and bake for 20 minutes. The top of the brownie should be set. Allow to cool before serving. The original recipe has you cool the brownies, cut in to heart shapes and decorate with extra cocoa powder. Trust me – you need none of that frippery! These were very simple to make and, while they didn’t eclipse my current favourite recipe, I’ll definitely be making them again. Of course – you can substitute any flavoured chocolate you like for the caramel chocolate. A few ideas floated around the afternoon tea table were using Cherry Ripes, mint chocolate, orange chocolate and I reckon even adding KitKats might be interesting! 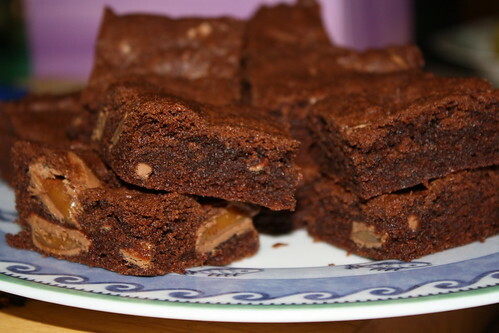 Alex, I consider myself to be something of a brownie aficionado (;-)), as I search for the “perfect” brownie recipe – a quest I never expect to complete – and most of the recipes I’ve used call for plain flour, not self raising. I think it helps to make them that bit fudgier. I’m looking forward to putting this on my list to try. Hmmm, interesting … my ‘standard’ brownie recipe uses plain flour but adds baking powder. However, I might make a double batch just to try out the plain flour option!